If this report is true, then another sad blow has been dealt another celebrity marriage .Damilola Adegbite and Chris Attoh's marriage is said to have crashed after two years.. Rumours of marital issues started when he wished her a happy 2nd anniversary on Valentine's day and she didn't respond or acknowledge him, which was so unlike her. Segun Olumide, a corper serving in Taraba State, died in a laptop explosion while sleeping last week. Olumide, who was serving at the Government Day Secondary School, Wuro Sembe, Jalingo, was reportedly placed the laptop on his laps and slept off. With tears in d eyes of many corp member Dis morning at federal medical center jalingo as they saw d lifeless body of segum been taken from d mortuary to his home town today may God grant him eternal rest amen. Stephanie Otobo, the alleged mistress of controversial General Overseer of the Omega Fire Ministries, Apostle Johnson Suleman today addressed the press at her lawyer’s chambers in Lagos following her release from Police detention. “This is not a blackmail,” she said adding that Suleman breached his promise to marry her. She said he had given her something to drink that made her sick. I AM JUST HAPPY YOU ARE BACK SIR. 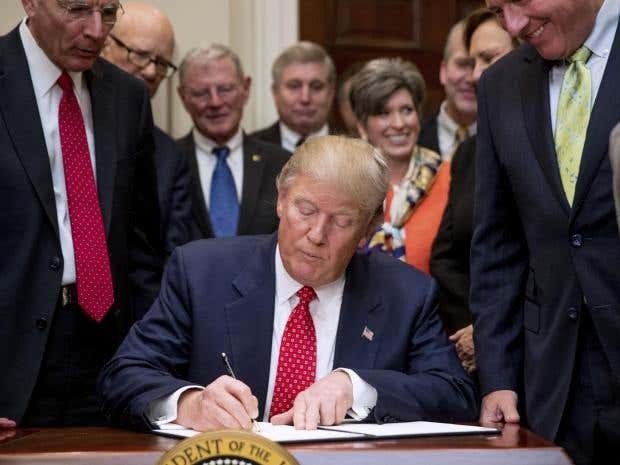 AT 74 YOU HAVE BEEN DOING GREAT. WITHOUT YOU THERE WOULDNT HAVE BE OSIBANJO. 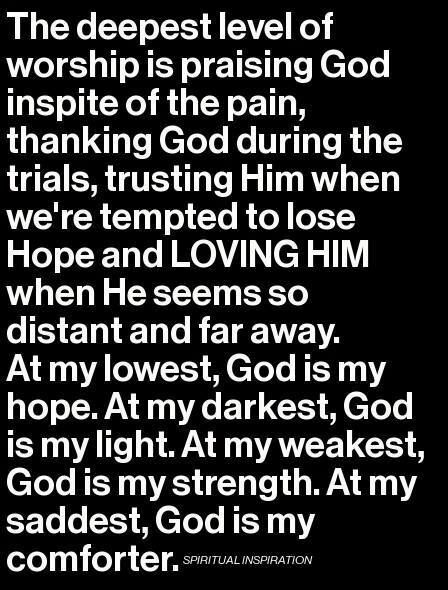 THOUGH MOSES DIDNT GET TO THE PROMISED LAND BUT THE FACT THAT HE WAS THE ONE THAT LEAD THEM OUT OF EGYPT CANNOT BE DENIED. YOU HAVE SHOWN US THE PATH, PLS TAKE YOUR REST WHILE THE ''YOUTH'' TAKE US THROUGH IT. 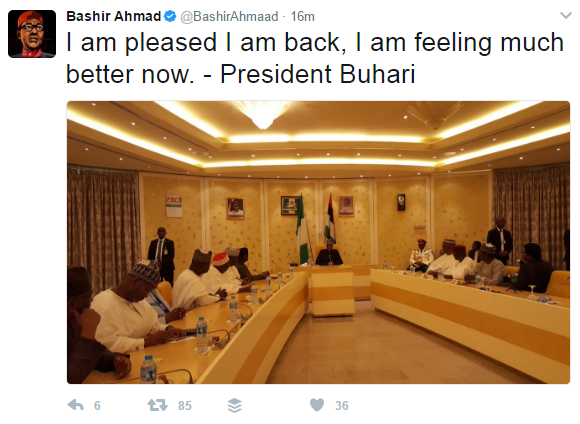 President Muhammadu Buhari, who returned to Nigeria on Friday after medical leave, said he will leave his deputy in charge for the time being and not immediately resume power. The 74-year-old said Vice President Yemi Osinbajo “will continue” in the role of acting president “and I will continue to rest”. No timeline was given for how long Osinbajo would be in charge. President Muhammadu Buhari and his vice, Prof. Yemi Osinbajo strolling in Aso Rock shortly after his arrival from the UK. 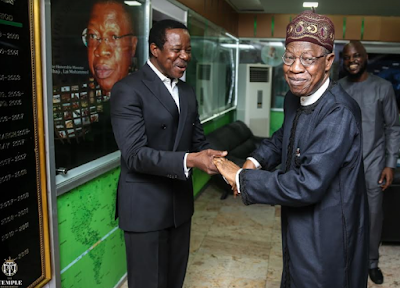 The Federal Government of Nigeria, through the Minister of Information and Culture, Alhaji Lai Mohammed, has announced the appointment of veteran Juju artiste, King Sunny Ade as an Ambassador of the Federal Government’s re-orientation programme ‘Change Begins With Me’. The appointment was consummated this week when the minister received the music maestro who paid a courtesy visit to his office in Abuja. 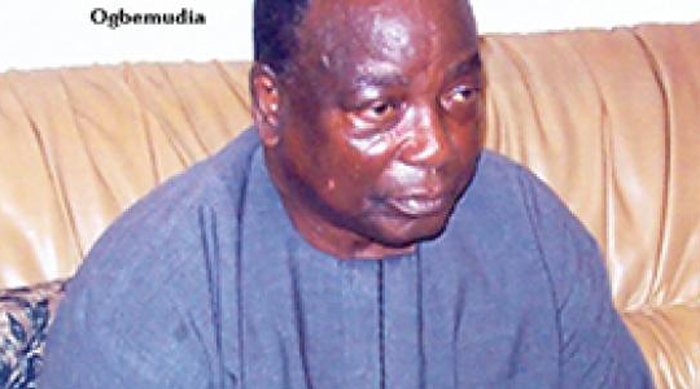 Former Military governor of Edo State, Dr. Samuel Osaigbovo Ogbemudia has died. He reportedly passed away about 11pm yesterday. A former two time Governor, Ogbemudia was appointed Military administrator of Mid-West state in September, 1967 - 1975 following the liberation of state from the fBiafran forces. 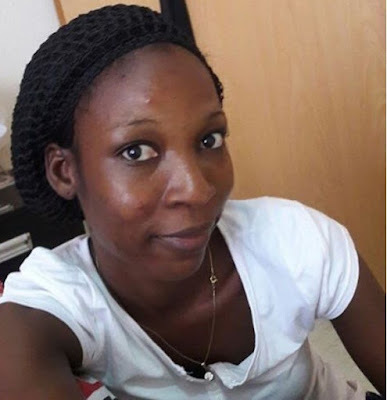 A lady has allegedly poured a content suspected to be acid on her ex-boyfriend in Uyo the capital of Akwa Ibom. 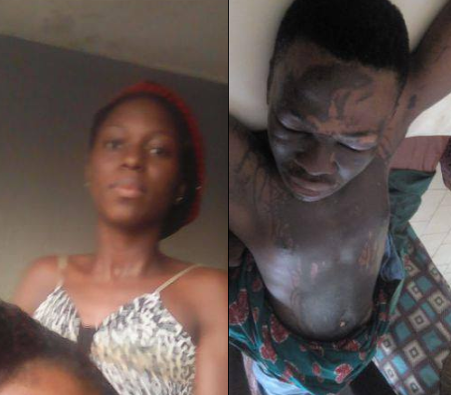 A lady has allegedly poured a content suspected to be acid on her ex-boyfriend in Uyo the capital of Akwa Ibom. On the penultimate Tuesday, Iniubong had retired to bed earlier on, when suddenly he was woken up by a gentle knock at his door. He wondered who could be at the door at such ungodly hour. The singer shared the interior of his house and even his followers have been like “wooww! Hooo my God, this is a castle” – and you can’t but agree… it really is wowing! President Muhammadu Buhari today received the Archbishop of Canterbury, the Most Revd and Rt Hon Justin Welby, at the Abuja House in London. A foremost Yoruba leader and former governor of the defunct Western Region, General Adeyinka Adebayo (rtd), has passed on at the age of 89, in his sleep. He was the father of former Ekiti state governor, Adeniyi Adebayo who headed the executive arm of government in the state between May 1999 and May 2003 before losing his re-election bid to Governor Ayodele Fayose for the latter’s first stint in office. Gen Adebayo became governor of the Western Region following the death of Colonel Francis Adekunle Fajuyi in the 1966 coup d’état. He held the position from August 4, 1966 to April 1971. The Lagos State Governor, Mr. Akinwunmi Ambode, has said his administration’s effort to reconstruct the International Airport Road from Oshodi is being frustrated by the Federal Ministry of Works. Ambode spoke at the Lagos House, Ikeja, on Monday, after carrying out an extensive inspection of some critical projects in the state, noting that the present state of the Murtala Muhammed International Airport Road was a national disgrace and required immediate attention. Congratulations and praises have been pouring in from all over the country. In a statement by his Special Adviser (Media and Publicity), Yusuph Olaniyonu, President of the Senate, Bukola Saraki, congratulated Osinbajo, on the occasion. “On behalf of all members of the 8th Senate of the Federal Republic, I wish our Acting President, Prof. Yemi Osinbajo, a happy birthday as he turns 60 today. 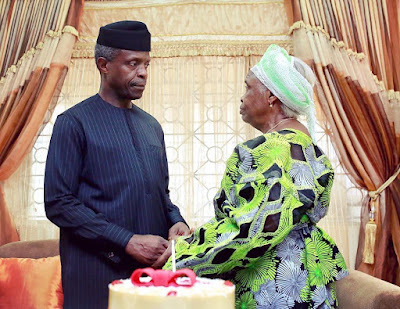 We pray to Almighty God to continue to give you good health, great wisdom and enduring grace to serve the nation, in particular, and humanity, in general, for many more years,’’ he said. H-I Idibia, Former member of defunct music group "Da Natives" and younger brother of African pop star Tuface Idibia has announced on his Facebook page that he has been denied entry into the United States of America. H-I Idibia who has been living in Woodbridge, Virginia for years now with his family made the announcement as his fans on Facebook could not withhold their surprises. Nollywood actor, Prince James Uche has passed on today, Wednesday, 8th March following a prolonged illness. A member of his financial aid campaign team, actress Chioma Okoye shared the news on her Instagram page. The actor was meant to travel to India this Saturday, March 11th for his surgery, but sadly passed on today. Read her post after the cut. 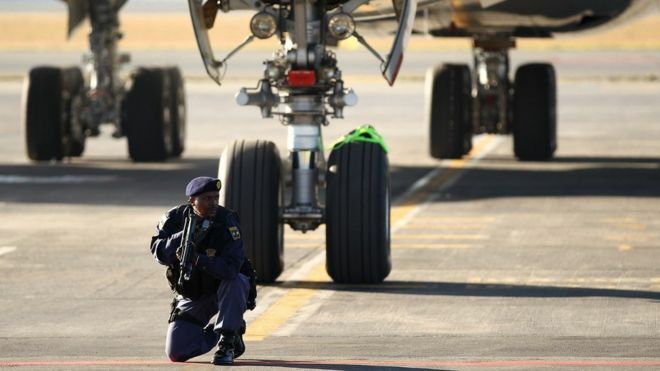 Armed thieves masquerading as police have carried out a robbery at Johannesburg's international airport in South Africa, reports say. The thieves are said to have driven into a restricted zone on Tuesday evening and taken containers of cash. (1) restraining the defendant (Prophet Lawson) from passing off his activities, or those of his congregation which are not those of the claimants (Trustees of CCC Edward Street) or their congregation, as the activities of the claimants by the use of the words "Edward Street Parish." The Italian government has deported 37 Nigerians for committing immigration-related offences in the country. 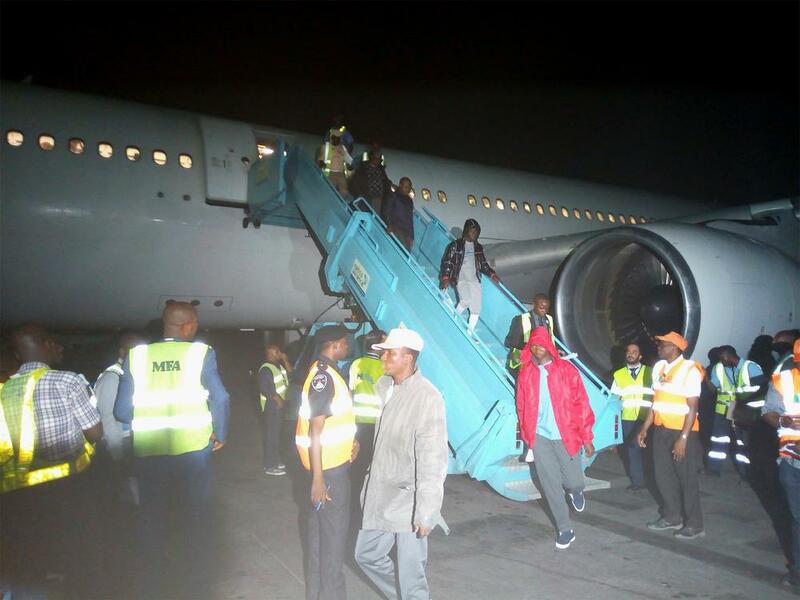 The deportees arrived at the Murtala Muhammed International Airport (MMlA) Lagos, on Tuesday night. The deportees,who are all males, were brought back in a chartered aircraft with registration number OM-IEX. that his wife poisoned his food to kill him in order to keep her alleged lover who is their landlord. Information gathered indicates that the late Faruok had complained that his wife poisoned his food which affected his health that had deteriorated all because she wanted to keep her secret romance with their landlord, a claim the wife denied. 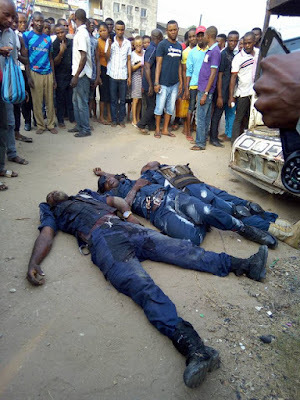 Three Bakassi (Vigilante) men were yesterday shot dead by unknown gunmen in broad daylight along Aba Owerri road, Aba. It was gathered that the incident took place before MCC Junction, opposite Seventh Day Adventist Church (Sabbath), opposite Toonak. 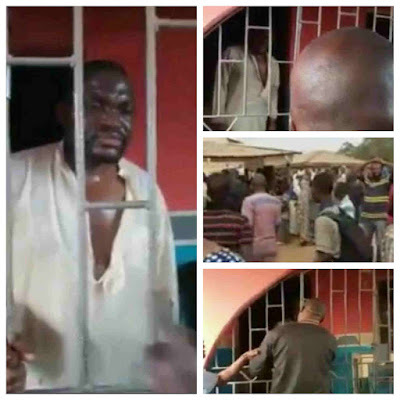 The incident claimed the lives of three vigilante men, while two of them were admitted to Abia State Teaching Hospital for treatment. At least 74 bodies of African migrants have washed ashore in western Libya, the Libyan Red Crescent said on Tuesday, the latest tragedy at sea along a perilous but increasingly popular trafficking route to Europe. The bodies were found near the western Libyan city of Zawiya on Monday, Red Crescent spokesman Mohammed al-Misrati told The Associated Press, adding that he feared more might surface. He said a torn rubber boat, the kind that usually carries up to 120 people, was found nearby. 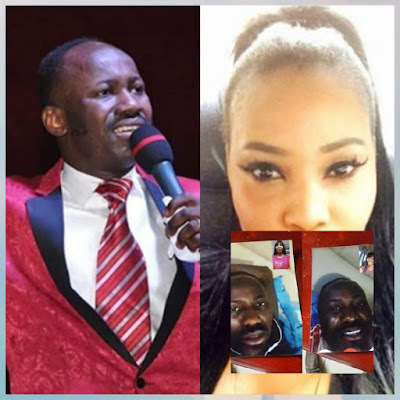 Apostle Suleman of the Omega Fire Ministry (OFM) has been at the eye of a scandalous storm since Stephanie Otobo aired intimate details of his alleged illicit affairs with her. Vice President (AgP), Professor Yemi Osinbajo SAN, clocks 60 today, Wednesday March 8, 2017. Here's a photo of him receiving blessings from his mother to mark his day. 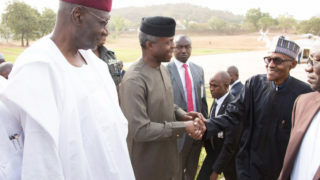 Acting President of the Federal Republic of Nigeria, Professor Yemi Osinbajo on Tuesday said that the Federal Government was committed to delivering a fast and efficient rail service system between Lagos and Ibadan within a projected time frame of December 2018. Osinbajo, who spoke at the Ground Breaking Ceremony of the Segment II Lagos-Ibadan Rail Project with Extension to Lagos Port Complex, Apapa, held at the Nigerian Railway Corporation compound, Ebute-metta, recalled that President Buhari, during his visit to China in January 2016, reopened negotiation on the Chinese support for the project under the Lagos-Kano modernization project. One of the affected Nigerians, who was banned from entering the United States of America, following President Trump's immigration ban, has narrated his experience at a United States airport. Over the last couple of days, the media has been awash with one of the most frivolous, creepy and outlandish blackmail efforts, targeting the good name of Apostle Johnson Suleman. It is not surprising that this recent intimidation attempt is coming weeks after the DSS brouhaha. To start with, Apostle Johnson Suleman has never had any face-to-face contact with the said lady. The stories she is selling to public exists only in her thoughts and in the imaginations of her paymasters. 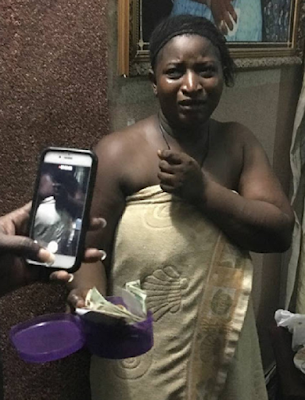 I don't know how true is this story but according to Dennis who shared the story on Facebook, a man was 'jazzed' by a lady after he failed to marry her. He wrote "This man promised to marry a girl and never fulfilled it so she jazzed him and he is now carrying her Bosom s on his chest. Bishop David Oyedepo, the man of God at Living Faith Church worldwide also known as Winners Chapel, wasn’t by all the blings and swags of Nigeria music star, Dapo Oyebanji popularly known as D’banj when they came in contact. D’banj was recently contacted to perform at a Youth Programme in Covenant University where the Bishop was also a special guest of honour.